It's funny to me, I've had enough experience with Tenkara to know that it is quite different than fly fishing. There is no comparison to the two in my case here. I've come to understand that some of my best fishing trips didn't start out as planned, they were opportunities that were realized while on a family trip or unrelated travel and they turned out to be epic fishing trips. Tenkara in itself has been quite a revolution in my fishing. In the past, as a fly fisherman (using western gear) I have had to make conscious decisions to bring my gear and everything that goes with it if I wanted to fish. Fly fishing is gear laden and often it is a hassle to gather the equipment knowing it may not get used. Although my family joins in and supports my fishing, it is not their primary goal on our adventures away from home and just gathering a few things will change the atmosphere of the trip, "Dad, this is not a fishing trip." But I've figured out how to be prepared for fishing in quite a stealthy way if the opportunity arises and yes, plenty of times, the opportunity presents itself. 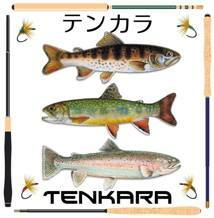 In developing my Tenkara travel kit, I have created fishing trips where they did not exist before. My Nissin Mini V3 kit is small and unobtrusive and has actually revolutionized my fishing in many ways. The kit is compact, a non issue. 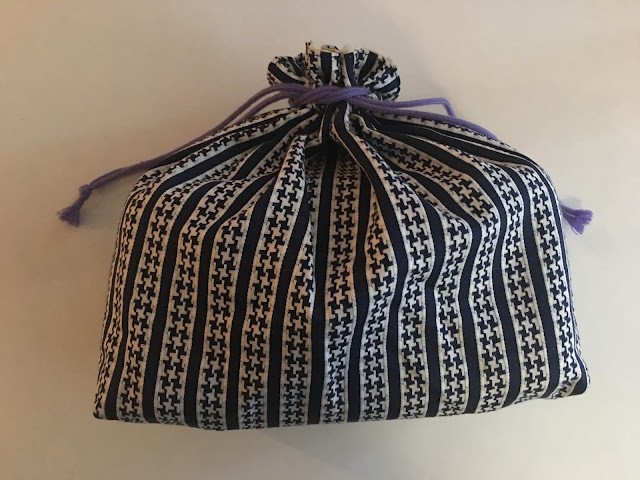 It is no problem to grab it and throw it in my carry on bag knowing that opportunity awaits and if it doesn't get used, it didn't take up any time or space. When I get to my destination or if I am on the way and the opportunity presents itself? I'm there to meet it. "Oh, hey, wait a minute, I have some free time this morning, I can go fishing at this tailwater, is it really that close?" "If I get up early, I can drive to this lake and fish the edges..."
Driving to my destination, "What is that under this bridge (in the mountains), I bet it's trout water!" My wife introduces me to her friend and her husband is a fisherman, "Do you fish?" "Oh, I just happen to have my kit with me..."
Or any of the possibilities that present themselves with travel with and without family. My travel kit is small, my equipment isn't oppressive, its out of the way but it is valid, a very serious kit that has everything I need, nothing more. 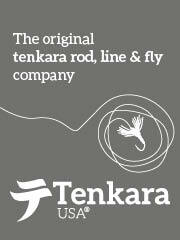 It has proven itself because I am a Tenkara Minimalist even when I am fishing my favorite stream or traveling to Japan. Here in this article, I will share the development of my tying kit that is geared for more than tying my wrong kebari, I can use it to tye nearly any Tenkara fly (or kebari) that I want. I've started with a C and F Designs "Marco Polo" vise and tool kit. In researching it, a couple of my online friends have the knock off version. I believe in supporting the people that create a design, if I can so I bought the C and F.
I have no problem with commitment when it comes to equipment that is well designed. It is a pricy little thing but it is complete. I purchased mine from Japan and got a great price. The tools are top quality and now that I have it, I really know this is going to be a primary vice too. I'll probably use it more at home for a year or so to wring it out and get familiar with it as I take it on the road. 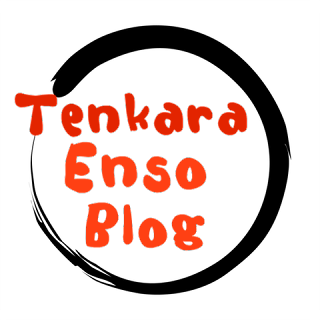 This summer's Tenkara Summit will be interesting! 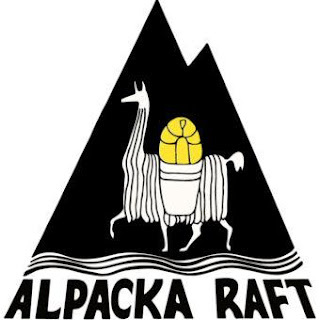 Last Summit I took place in a tying contest. I had to borrow a kit and materials but I was fortunate and put together a good kebari and I placed third. I won't be without my favorite gear this time, it will be right along with me. I have the core elements of the kit now. I have not put together the material bag for my feathers and other supplies. I'm working on it now. I don't want to take a lot, just what I need. The video above shows the Marco Polo designed bag. I'm not sure I need that much. Besides the kit itself, I need feathers, thread, dubbing, wax and cement. The fun problem is figuring out each element to take along. Not what I want to bring, only what I need. I've decided at this time to keep things minimal and have ordered a C and F DESIGN Multi Case Size L. It is the same case that my kit is in except it has a clear top and it is empty. I have checked the size and I will be able to keep my fly tying glasses, feathers, zenmai, dubbing, cement, wax, extra hooks and everything else that I need. 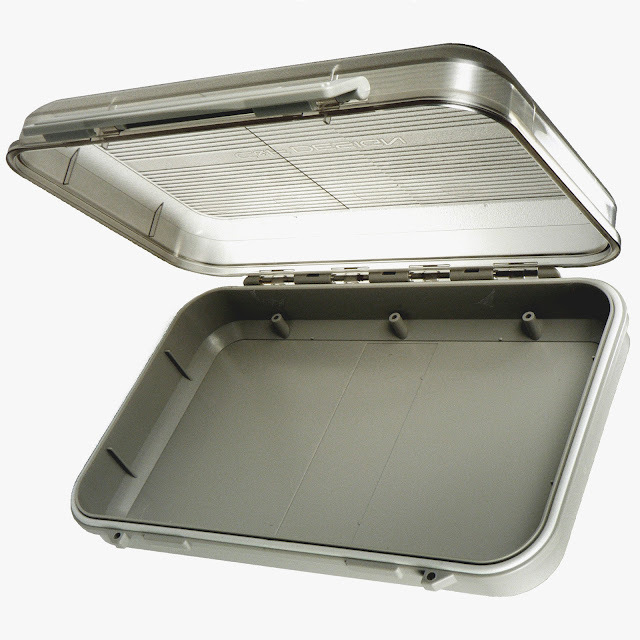 The case is roomy inside but still compact, as in the size of a large fly box. I purchased a couple of extra spools. Each one holds three colors of thread. You load the thread on the spool with a drill. The spool will hold a whole spool of thread. I like that, you don't have to spend a lot of time loading spools up. We use a lot of thread tying. I got lots of thread. Different colors, small kit. Choosing hooks was easy, I just loaded up hooks that I use. My bait hooks are in there and my Ishigaki style fly hooks too. I left a couple of bins open for hooks that I get from people or for pre-made loop eye that do not get tied. I use a miniature 7 day pill container for dubbing. A little dubbing goes a long way. My reading glasses will go into the kit as well. For travel, I just put in my Dollar (General) 2.00 magnification readers. I'm going to try "Sally Hansen Hard as Nails" for glue/coating. The bottle is small and the tyers rave about it. I pulled out the brush fibers and replaced that with a needle, the bottle is tight lidded and does not leak. With the Hard-as-nails I have glue and coating if I want. It is just about the only "new" thing I'm going to try in my kit. My dollar store magnifiers are sweet. I can see through them clearly, the case fits inside the tying kit nicely and if I lose or break them? One dollar. 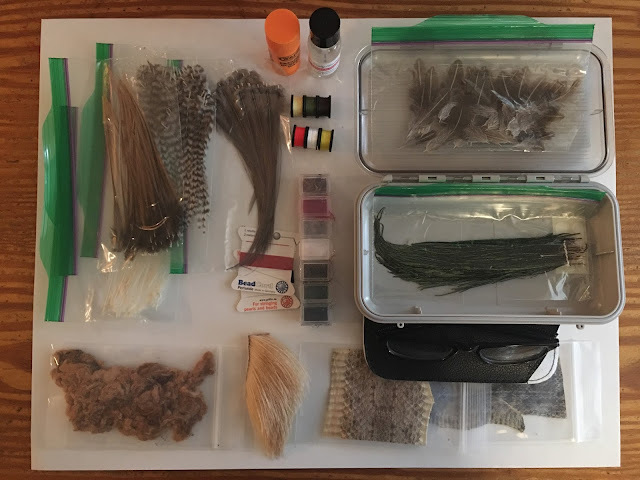 Plucking feathers was good, you spend time grading what you want to the kit, shove them in "snack" baggies, extra thread spools, silk bead cord #2, just the basics, just what I use. A complete materials kit in a large fly box. Sally Hansen "Hard as Nails"
I added in a hook I've been wanting to try. It's a ultra sharp fine wire bait hook. I'm thinking that this one will really give some great action being light and penetration from being fine wire. The pack is small and flat so it just lays on the bottom. If I like this hook, I'll start buying it in more sizes to find the sweet spot. I may add in a Gamakatsu bait hook too. The kit is in flux, I hope it always be. I'm going to experiment with it, use it as my primary tool set to make my kebari. So I'll need to have some projects in there like I have in my house vise. I also plucked some size 14-16 size feathers. I think the smallest hook in my kit is a 15 and 16. Most are size 7.5 (Japanese bait hook size) but I need to be able to tye up some 16's for smaller fly days. It all goes in there with room to spare. 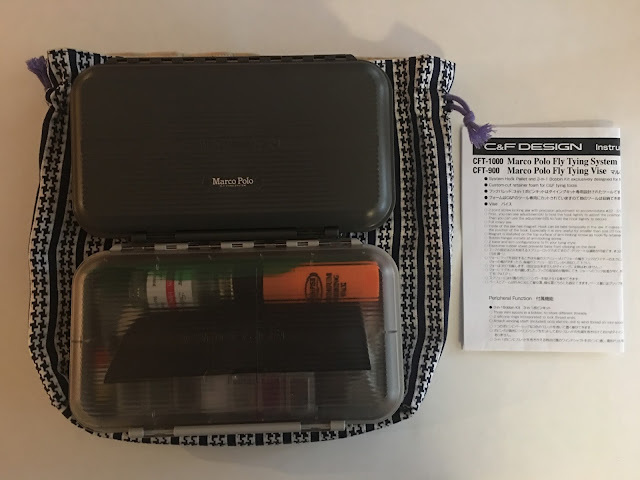 I'm super impressed with the quality of the Marco Polo kit and the materials storage box is just the same. My first Ishigaki style (Jun) kebari from my kit. I pulled out a half dozen from my last session tying them and it's right there with those, I put it in the fly box and it disappeared with the others. I'm totally happy with the kit. I have quite a variety of materials that I can pretty much tye any Tenkara fly that I have used and I added in a little Elk Hair patch so I can tye up kebari out of Hiromichi's book, "Modern" (Contemporary) Tenkara. I dig the patterns in that book. As a matter of fact, the book is filled with wise knowledge of Tenkara. 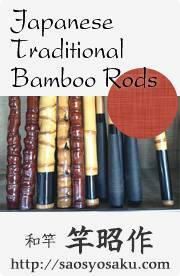 If I were starting a Library of Japanese Tenkara books, this is a must have and would be a great start. Anyway, the kit is set. The next time I visit this page and update it will be when the kit is on the road somewhere. I've had the kit for a few months now and have used it enough to know that I will begin to use it as a primary tying kit. I've dismantled my big toolbox tying kit and traded it in for a storage box. I've kept my old vise for teaching and for times where I'm just tying in big numbers. I could use my travel vise for that except, it is a little more tedious with the dual tightening knobs, I would rather wear out the cam on my home vise. I'm slightly worried about traveling with the scissors, I'll find out very soon as I get on the plane to go to Colorado.